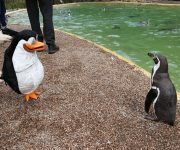 X-Factor 2016 winner Matt Terry came face-to-face with our colony of Humboldt penguins, but it was his puppet co-stars who caught our birds’ attention! The singer, who was joined by some of his fellow cast members of Madagascar the Musical took time out of their tour to visit DZG ahead of their stop-off at Wolverhampton Grand … Continue reading From Madagascar to DZG! 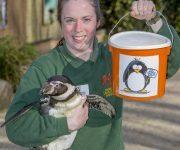 DZG animals help woo valentines! Every day is Valentine’s Day for our loved-up Humboldt penguins, who pair for life, so why not let them help woo your loved one this forthcoming February 14. The flightless birds are monogamous and begin searching for a mate around two years-old, recognising each other through vocalisations. 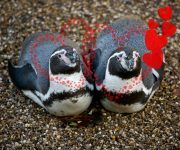 They also nest in the same boxes year-on-year, … Continue reading DZG animals help woo valentines! Our oldest Humboldt penguin, Pingu, is celebrating his 26th birthday today! He’s a very special penguin to DZG as he was one of the founding members of the zoo colony back in 1991 having been hand-reared by keepers. 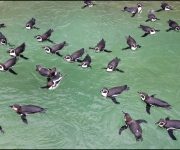 The breeding programme, which was honoured with a prestigious BIAZA conservation award ten years ago, was headed … Continue reading Pingu’s 26! Our annual census is well underway and creatures great and small are being counted across the zoo’s 40-acre site. 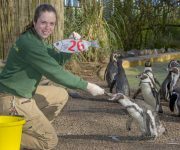 For most species it’s a simple matter of a quick head count, but bird keepers came up with inventive colour-coded strips to help identify individual Humboldt penguins in our colony – one of the biggest in Europe. 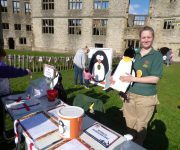 Section Leader, … Continue reading Identifying penguins! 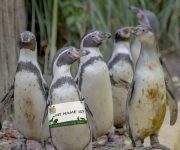 We’re offering DZG supporters the unique chance to adopt and name one of our Humboldt penguins! We’ve had great success with our colony since we started it off in 1991, with just five hand-reareds and now have a headcount of 85 – one of the largest colonies in the UK. But following a recent ID … Continue reading P-p-pick your own penguin! 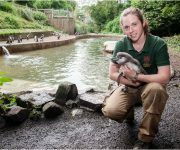 Some of DZG’s animals feature in a new educational CBeebies television series, which began airing yesterday. 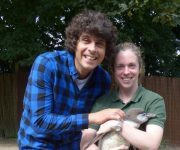 We took part in the filming of Andy’s Baby Animals back in July, when popular 6’4″ children’s presenter, Andy Day, visited the site to meet one of our baby Humboldt penguins and three newborn peafowl chicks. The 20-part series … Continue reading DZG on CBeebies!